Probably the most anticipated event on tour, this year’s event once again exceeded player’s expectations. Halfway through a warm-up round on Friday arvo and whilst taking in the majestic view of the mighty Waikato river from the 14th tee [Players who don’t take the over-the-edge look here should receive a penalty shot] I reaffirmed my belief that this is the best course in Aotearoa [probably cause I’m a Lefty as well]. Walking and playing the course Spa Park seems so innocuous and fairly easy, but once it bears its razor sharp teeth and 6s, 7s and 8s start appearing on your card, you’re inclined to look at the course from a slightly different perspective. I’m sure most players of all levels suffered these, and who came away without any blackberry cuts? It is truly a great challenge to master this course. DAVE ROUTLEY… you’re an absolute legend !!!!!!. Thanks so much for saving the day by recovering the missing baskets…. wish you could have played. Great condies welcomed us on Saturday and even better 6 entrants in the girls division. Ming, I think you’ll need to start training as there are several girls wanting to knock you off your mantle…. you must be loving the competition.. The 1st round tossed up casualties with many tales of disaster with Josh even getting an 8 early on and myself a 7, not the start you want but many players were in the same boat. I got to watch Helen play and she taught Bruno, Baz and I the way to putt aggressively and confidently. Once again Simon was in command with Mark H coming 2nd on the back of a round of amazing putting, apparently sinking everything inside 10 meters. The usual suspects followed close behind in a very tight field, with the man who clocks up more miles making it to events, the well-healed and well-spoken Tim Mc Vitty making it into the top group. 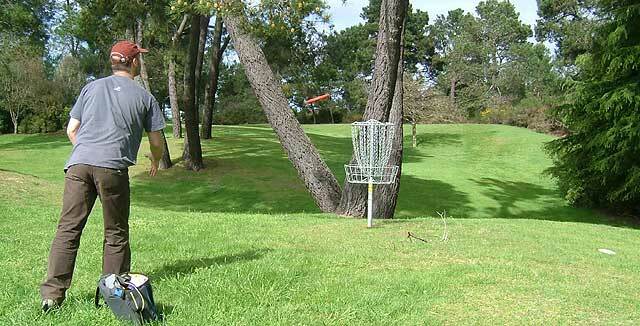 2nd round and time to make your stand or just have another crack at de $400+ up for grabs for an Ace. 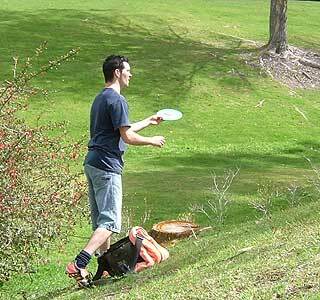 While many boasted of close calls the kitty still sits safely in the hands of one of disc golf’s most trusted members. Round 2 dealt up trials and tribulations like a good game of poker with Josh shooting a 53 to make a charge up the leader board. Also showing up for the 2nd round to take on Toby Gentil  in the juniors was Max Conway  from Tauranga who looks like he’s played all his life. Fantastic to see and I’m looking forward to watching their duels in future. Many lost sleep on Sunday morning to the sound of rain and extremely strong winds…. [Congratulations to the All Blacks for their semi final win over England]. The 3rd round was going to be one of survival and high scores especially in the exposed part or the course where the winds were the strongest I’ve played in for a tourney, double and triple bogies were to be prevalent with only 1 player breaking 60…. The wind and trees can sometimes be your friend. Des also came away with a strong finish for a 60 to narrowly miss out on taking Blair down…..Maybe on your home course Des. Simon showed his usual poise to lead by 3 strokes going in to the ‘Super 6’ play off with Myself, Mark Hamilton, Siep Van Vliet, Bob the GM and Josh Smith fighting for the leftovers. Josh was the only one to better his position actually leaping 11 spots from the 1st round. 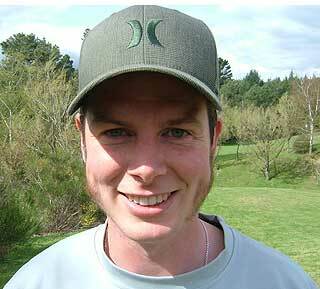 Congratulations on another Open win Simon Feasey, it must be a nice feeling not needing the 50 Tour Points. Divisional wins also went to Ming in Woman’s Open, Bob in GM’s, Robyn Joynt in Junior Woman’s [Under 18], Toby Gentil in the Junior Boys [Under 15] and yours truly in the Masters division. Well done Bob on another very well run event. 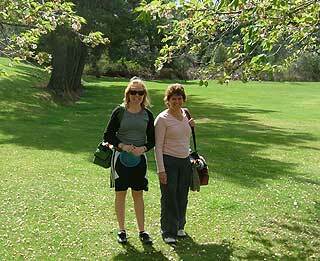 Kirsty Williams and Ming Menzies pleased to find a woman's tee on the notorious Spa Park hole #4. The GM sits on the rail on the 14th Tee overlooking the crystal clear water of the Waikato River as it starts it's journey north to Auckland. Shame it's not as clean as it is here by the time it gets north and becomes Auckland's drinking water! Spring had well and truly sprung! 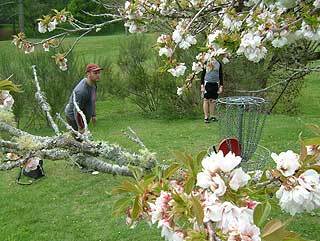 Hole # 10 looked a picture as Martin Galley putts under the sprinkle of blossom from the Cherry trees. 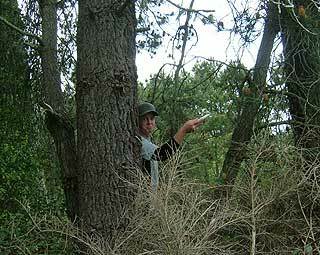 Auckland Golfer David Keene found a spot of trouble on the 'down to the river' hole #8 - and he wasn't the only one! Mark Hamilton - always a pleasure to watch. His consistent putting over the weekend was great to see, and paid great rewards. 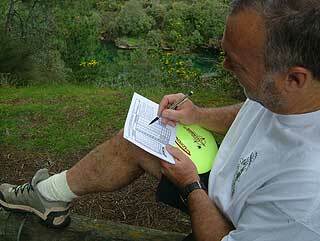 Here he plays out the 'dirty dog-leg' number 11. Whale Watching. Bruno Whale in the thick of it. There are some places in Spa Park that you really don't want to end up. Most were found over the weekend. De Dev shows his putting style on the 'Spa Park Signature hole #8' watched by his second round playing partners Paul Cohen, Nigel Barnwell and Nigel Hailstone. Mike Corbett on the elevated Tee on hole number 6. 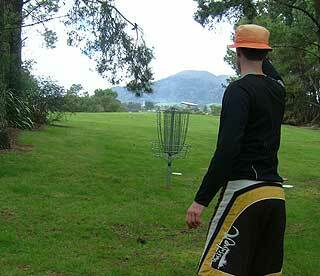 The Auckland Ultimate player is getting to grips with the flight of Golf Discs. Mark Hamilton putts out hole 13. Will his putting confidence hang over till next weekend's 'Smokin Mountain? 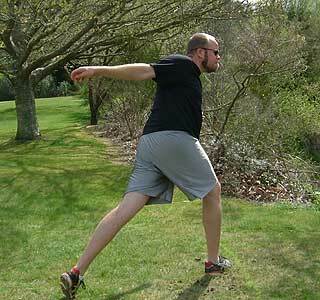 Jack Turner, another Auckland Ultimate player getting well acquainted with all parts of the Spa Park Course. I love this way more than Ultimate!" Jack Turner was heard to say numerous times over the weekend .. the grin says it all. Sheree and Toby  Gentil played two rounds with Jimmy and Max  Conway. It was fantastic to have a competition going on in the Junior Boy's. The Iceman Baz Keene cleans up as bed time approaches late on the Saturday night (or was that Sunday morning? - ed).